Historic Mariposa Hotel Inn on Hwy 140 located is in the center of town, a short walk to unique shops and great restaurants. Evelyn and Carmelo’s Room is our large “honeymoon suite” with private entrance off the garden deck. Our special occasion room is a very spacious suite size, secluded from the other rooms. Its extra amenities make it very special. The private entrance off the garden veranda features upgraded linens, stained glass window, a window desk, and handmade oak wood trims galore. The king pillow top bed is so comfortable! Honeymooners’ favorite, Tub/Shower. Marguerite’s Room has a Queen bed, claw-foot bath tub. 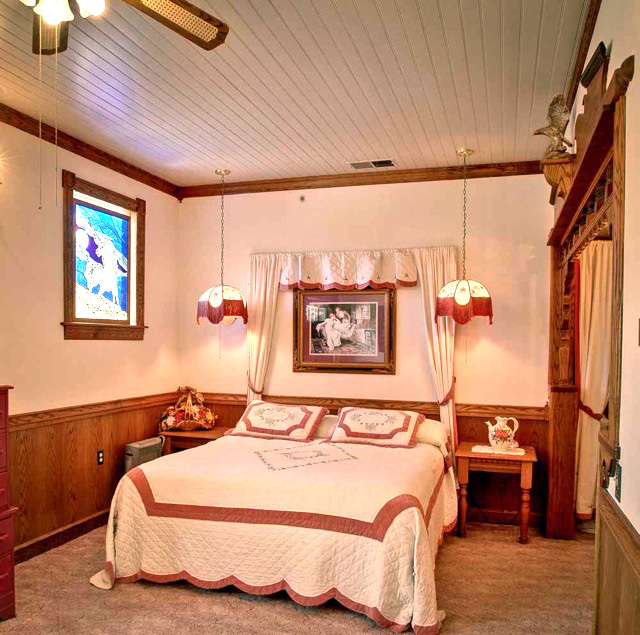 Spacious and romantic, stained glass, antique furnishings, and the original 1901 clawfoot tub. Window view of the garden veranda and the trees on the mountain behind the building. One very comfortable pillow-top Queen bed. Claw-foot tub. 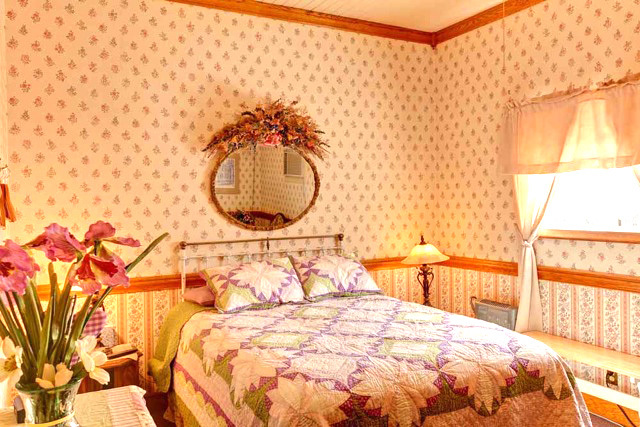 The Gertrude Room features a king-sized bed and queen-sized bed, perfect for families. 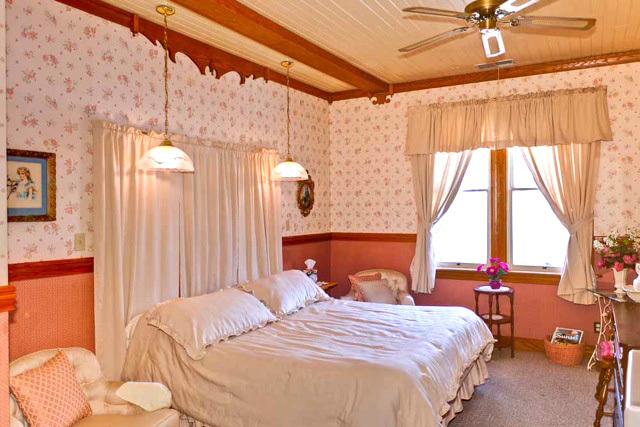 The Gertrude Rose Room sleeps four. A lovely, spacious room with a King bed and a Queen bed. A separate Milady’s dressing area with her own sink and dressing table. Tub/Shower. Helen and Maurey’s Room is the only room that faces main street. Windows overlook the shops in the historic village. A lovely, sunny, room. King sized water bed, room for queen-sized air mattress to accommodate four guests. Tub/Shower. A good room for early risers and folks who need some city sounds to feel comfortable. Nana Ann's Room at Mariposa Hotel Inn a lovely place to stay when visiting Yosemite National Park. 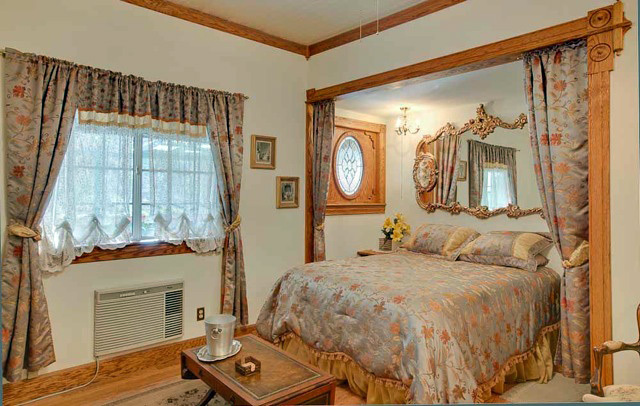 Nana Ann’s Room is our adorable granny’s room featuring nostalgia. Large bathroom with walk-in shower (no tub). One Queen Bed with pillow top. 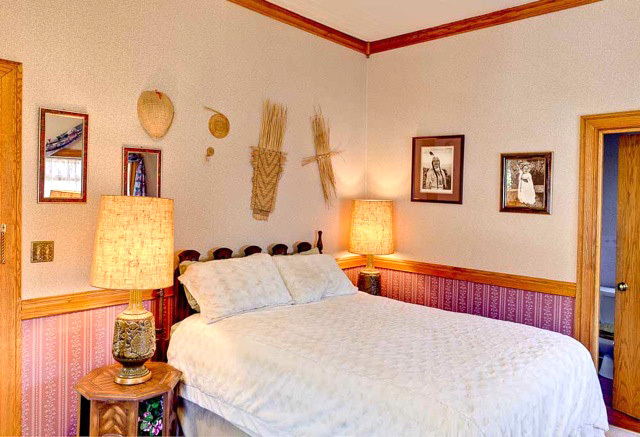 Della's Room is a beautiful tribute to Native-American Miwok. The Miwok tribe were the original occupants of Yosemite Valley. Della’s Room is light, airy room with a garden window and view of the mountain behind the hotel. Decor is native American with Della’s handmade basketry. This room is more masculine. Pillow top Queen bed, Tub/Shower. Enjoy breakfast on our deck and enjoy dining with the many humming birds that visit and the view of Mariposa Creek. 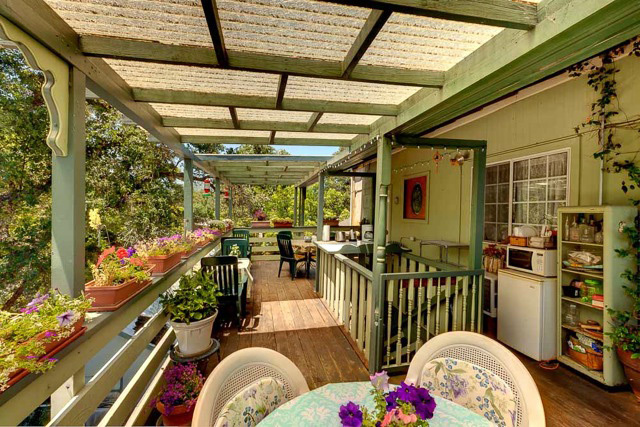 The Mariposa Creek Garden Veranda is a delightful place to socialize and meet new friends from around the world. A great place for birders to bring their binoculars to watch the birds on the mountain in back of the hotel. Morning coffee/tea with pastries is served here. Bring your own wine bottle, appetizers and enjoy the veranda before and after dinner. Mariposa Hotel Inn lobby with many historical photographs from 1850 to present explaining the history of Mariposa, California and Yosemite National Park. 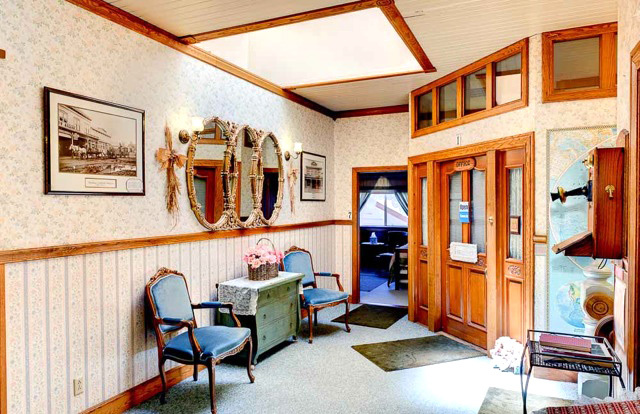 The Mariposa Hotel-Inn is a non-smoking facility. All rooms have contemporary amenities including a hair dryer and plush linens. 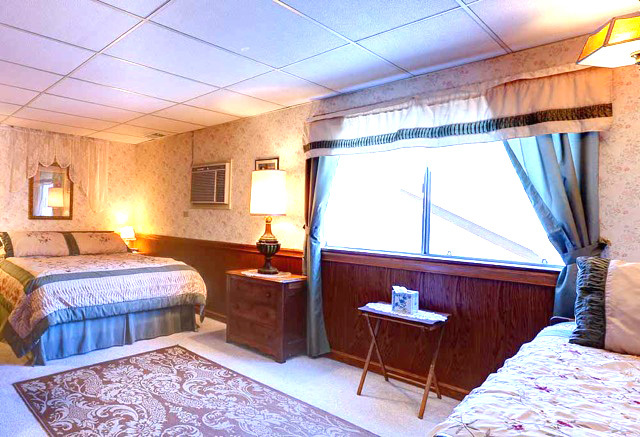 You can relax and sleep comfortably, our heating and air conditioning system is individually controlled from each room. Surround yourself in a bed of luxurious linens and wake refreshed. For your convenience, we accept Visa, MasterCard. $20.00 for each additional person. Reservations guarantee with a 48 hour cancellation policy. Check in time – Rooms are usually available for check-in by 2:00. If you need to check in after 6:00 PM please call 209.966.7500 to confirm a late check-in. Check out – 11:00 a.m. We promise that you will not hear a vacuum cleaner or a knock on your door until check-out time. Pets – Sorry, we cannot accommodate pets. Extra Guests – Two of our rooms can accommodate up to four people. There is a $20.00 charge for each additional person. Cancellation policy – Three-day minimum notice is required in most situations for full refund. If reserving three to six rooms – a 14 day notice of cancellation is required for full refund. Holidays – A two-night minimum with a seven day notice of cancellation. Planning a Wedding Or Special Occasion? We suggest Evelyn & Carmelo’s Room. 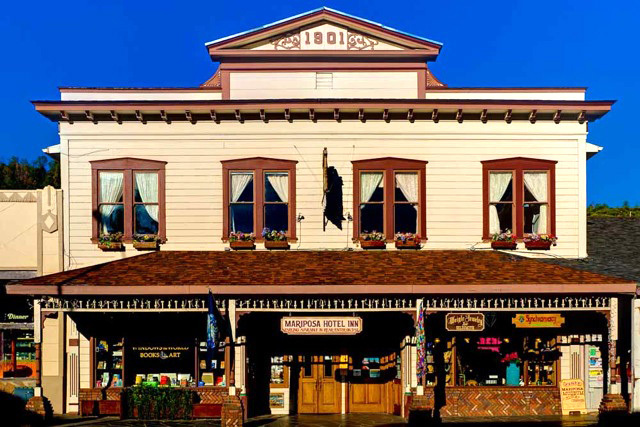 Groups Family/Friend Gatherings – The Mariposa Hotel Inn is a great place to gather…You can reserve all six rooms. When all rooms are reserved to the same group, the front door is locked and the hotel becomes YOUR private space. With our central location, you’re just a short walk from excellent restaurants and specialty shops. Mariposa Hotel Inn Gift Certificates – Gift certificates are available. A great gift for a birthday, anniversary and other special occasions. the friendly service and charm of a bed and breakfast inn. If you are a bit late making reservations for Yosemite hotel rooms this season give us a call anyway. hotel room when visiting Yosemite National Park. We require 3 days advance notice in order to cancel a reservation for any reason. Late cancelations will result in one night charge. No refunds will be issued for early departures. As a small family owned inn, we are greatly impacted by late cancellations and no-shows. Please understand we must strictly enforce our policies. By placing a reservation you are agreeing to these policies.